You're Slavya, a character from the Everlasting Summer visual novel (which is really good by the way and free to play so if you haven't yet - please do!). In Everlasting Summer, Slavya speaks about a village she grew up in as a child. You are returning to this village to visit your gram gram but sadly all you find is her empty house (well except for the cat) and nobody knows where she went. The only other human you interact with is the woman who runs the shop called Aunty Whats-Her-Face. Aunty tells you how there is a lack of potions for her to sell in your gram grams absense and you take on the role to learn her trade and hopefully find gram gram in the process. Navigation in The Herbalist can be done either from your hut or the door menu. Other than that you can also access you inventory by clicking the sack, the Grimoire by clicking the book, view your achievement progress by clicking the flag in the top left corner or exit/go back by clicking the flag in the top right corner. How do I interact with objects? 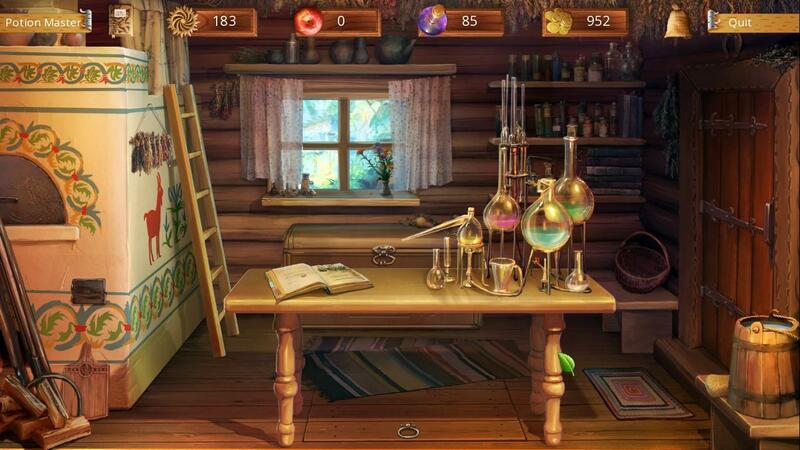 You'll be able to combine items, cook and more when you're at the potion making table. Some interactions will add extra dialogue or even cutscenes. It is not possible to kill your character through this so have fun while you figure out what everything does. These items can be purchased using coins. Coins are made by selling items and finding items while digging that are automatically sold to the pawn shop. It is important to think carefully about how much you are selling an item for - for example if I buy an apple (8 coins) and a bottle (5 coins) I can combine them at the potion table to make apple juice which I can then sell back to the shop for 10 coins. Do you see the problem? It costs me 13 coins to make this item and I only sell it for 10 coins. A better option is to combine the juice with sugar (that you find in the barn for free) to make cider! Now I can sell the cider for 15 coins and make a profit. How do the potions and herbs work? Every new game file you'll have access to 8 herbs and 4 mushrooms when you go out looking for herbs. It is important to remember that every new file will have 4 good herbs and 4 bad herbs. This will change every new game! If you are following a playthrough or guide, keep this in mind. That playthrough will most likely not have the same good and bad herbs you do. Below is a picture of the 8 herbs you'll find. You'll also be able to find these mushrooms. There a no bad mushrooms, all of them can be used for cooking but the recipe they go into is going to change for each save file. So for example, in your first playthrough the blue mushroom could be used to make fried mushrooms but in the second it could be used for pickled mushrooms instead. A good place to start with potion making is to identify which four herbs are your good herbs and go from there. You will know that a herb is a good one if when it is combine with a bottle at the potion making table, you get a level one potion. If the herb is a bad one, when you combine it with a bottle you will get green sludge which you can remove by washing the bottle with a sponge or if you don't have one yet, you can sell the bottle for 1 coin. In my playthrough the blue berries, big yellow flower, pink flower and red berries were my good herbs and they made the level 1 potions below. 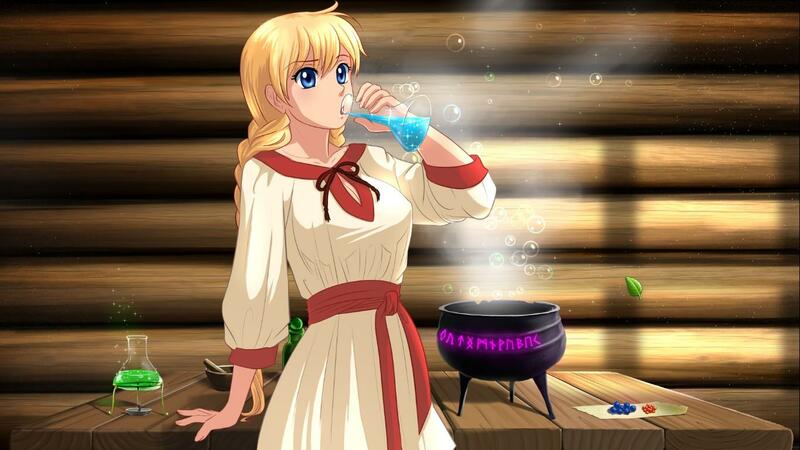 Level 1 potions are made by combining one good herb with one bottle. Level 2 potions are made by combining two level 1 potions that are not the same colour! Level 3 potions are made by combining three level 1 potions that are not the same colour! Level 4 potions are made by combining four level 1 potions and one colour is repetead twice except for poison which is one of each colour. Overall, selling potions is not very profitable if at all unless you are looking at level four potions. How does energy / stamina work? Everything you do with the exception of travelling between different areas in the hut and shop will cost you stamina. The amount of stamina you have is marked on the top of the screen with the little purple potion bottle. Chances are you've played a day or two and now find that you are starting your day with very little stamina. You'll wake up with less than 50 stamina, play with the cat but still can't get anything done. If that's the case you've yet to learn the most imporant secret to keeping your stamina up and something I totally glossed over when I started playing - apples!!!!!! If there is an apple in your inventory when you go to sleep, you will eat it the next day when you wake up and start off with over 100 stamina. Yes I know! You can also increase your stamina by eating food you have cooked. Slavya will not eat the same dish more than once per day unless it is a liquid. With this in mind, early game your focus should be on collecting as many herbs as possible in the day, selling them and buying apples. Once you have enough apples for a few days you can start focusing on buying bottles for potion making. If you read the section above about navigation, you'll see that you don't click on the stove to cook but rather cook dishes at the potion making table. In order to cook every item you'll need the following foods: apples, eggs, flour, milk, salt, sugar and the mushroom types. Strangely enough you'll also need a fire elemental potion (the level 3 potion that looks like a fire is burning inside of it). You'll be able to buy apples and salt from the shop, pick mushrooms in the forest and find egg, milk, sugar and flower in the barn. You'll also need a pan (there is a 1/17 chance of digging up a pan which you will then need to wash with a sponge in order to use) and bottles. Recipes are broken down into three categories: egg based recipes, apple based recipes and mushroom based recipes. You'll also be able to combine egg, milk and flour in different ways. As said before, the type of mushroom that aligns with egg recipe will change for every game save file! It is not always the same type!